Davido’s first baby mama, recently shared a sultry picture of herself on her social media which one of her followers perceived as inappropriate. According to the follower who though complimented the photo as cute, said Sophia isn’t supposed to expose her "flat breasts" to the public and further advised her to take down the picture. 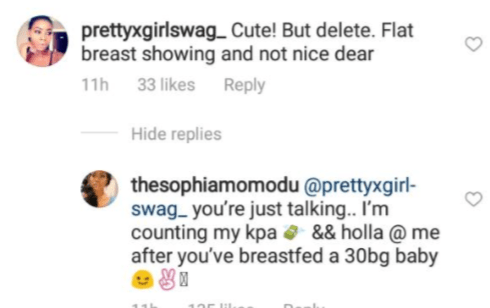 Sophia who saw the comments as a slight shade and clapped back at the follower, telling her to holla at her after she has breastfed a ’30 billion gang baby’. 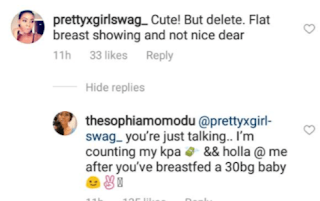 The savage follower not relenting reminded Sophia that another of Davido’s baby mama Hailey has breastfed a 30 billion gang baby and she doesn’t have flat breasts. See their exchange of tweets below.